Winter may be chilly where you live, and the nights are longer. On the plus side, tis the season when Shopping Girls find lots of ways to decorate, celebrate, and worship, featuring perhaps the all-time most wonderful celebratory decor item: Candles! Next up in this wintery season of candles is the Festival of Lights, Hanukkah. When it comes to beautiful candles and Hanukkah menorahs, there are so many options for a Shopping Girl to choose from, her head may spin. But relax and take a deep breath, for the holidays are stressful enough as it is. Let ShoppingGirl.com share a few possibilities with you to make your holiday shopping a bit easier. This Water Lilies Menorah has a lovely natural look for tree-hugger or Art Nouveau Shopping Girls. Paraffin Menorah Candles by Safed Candles in a gorgeous color design. These beautiful candles have the look of early 20th-Century Arts & Crafts pottery or enamel designs, and would be perfect in your Water Lilies Menorah. Bold Color Design Chanukah Candles from Safed Candles. Get this bright, happy led-light menorah, and you won’t have to worry about using candles around your kids or pets. Or use this to liven up your workstation and get yourself amped up during the day for evening parties and events. Giving Christmas trees a run for their money, this battery-operated multi-tasker can be set for steady, blinking, chasing, or sequential light patterns. The Menoji Menorah uses two AA batteries, which should last for a while, because led lights don’t require much juice. This vibrant Butterfly Hanukkah Menorah was designed by artist David Gerstein. Breaking free from the traditional blue, silver, and white theme of the holiday, it is colorful and bright even when the candles are not lit. It offers a sense of animated vibrancy to your decor, which will be uplifting to your spirit even on a gray overcast winter’s day. A colorful menorah calls for colorful candles. Featuring a delightfully subtle honey fragrance and the steady, even burning that beeswax candles are famous for, each candle in the box is individually wrapped to keep it neat, clean, and fresh. Rite Lite Pure Natural Beeswax Chanukah Candles. Speaking of honey, and lighting candles, you’ll want a pretty matchbox handy throughout the festival. This cute matchbox features several frisky little bees that look a bit like they are dancing the Macarena. Scientists have proven that bees do dance, and you should, too. Shopping Girls who admire enameled decor items are probably also Art Nouveau and Art Deco fans. If you are such a fan, then this menorah may be the one for you. It looks like a legit antique. Besides this wonderfully popular and flattering color palette of peach and green tones, it is also available in a blue or maroon color scheme. No, it’s not cheap; that’s a lot of detailed enamel work there. But if it is going to be a family heirloom that you pass on to your children, that suddenly makes it seem much more affordable. Floral Tree of Life Hanukkah Menorah. Another stunning enameled option that is particularly symbolic for Shopping Girls celebrating in places like Southeast Asia, Polynesia, or Florida, this petite menorah features tropical plumeria flowers blooming about the front, with buds along the top forming the candle cups. At about eight inches wide, it is an adaptable decor piece for the holidays that will fit most anywhere you’d like to display it. Michael Aram Goldtone Hanukkah Menorah. This Post-Modern golden menorah has a faceted chiseled look, as if it was carved out of ancient stone, then gilded. The Michal Aram Gold Tone Hanukkah Menorah make a great centerpiece for your table or sideboard. Synagogues Of The World Menorah. If you are a Shopping Girl who travels, collects and displays miniatures, or has family around the globe, this adorable menorah will appeal to you. It features replicas of nine different famous synagogues from around the world, each charmingly painted with wonderful detailing. The location of each synagogue is printed on the base, and there are pretty golden orbs to hold your candles. Synagogues of the World Menorah. For Shopping Girl travelers of a nautical persuasion, this modern menorah features an abstract sailboat design in crystal, highlighted with a row of silvertone tankard-like candle cups. Note the tiny etched captain’s wheel and Star of David details. Here’s grog in your eye! Landlubber Shopping Girls may prefer to cruise the Festival of Lights with this retro ride. Nicely detailed and featuring a patina finish for an authentic look, the Pink Cadillac Menorah is a delight to light. How about some hot pink matches in a festive, sparkly matchbox to light your Pink Cadillac Menorah candles? The matchbox features excellent advice in two mottos: “Cheers!” and “Let’s Celebrate!” Thanks, I think we will! Celebrate Decorative Boxed Matches. Retro in a different way, this stylish Art Deco design features a geometrical, contemporary look in opaque black with dashing cut-outs that add a sense of energy. Silvertone candle cups rise like award winners to the apex of a stage, creating a beautiful sculpture of light and form. Black Crystal Hanukkah Menorah. This Mid-Century abstract Tree of Life is made with a lovely ivory porcelain, reminiscent of pieces produced by Lenox, so Shopping Girls with Lenox or similar fine tableware can keep the look going through Hanukkah. Like pretty jewelry settings, the candle cups are goldtone bezels inset into the tips of the branches. A very sleek and pretty modern candelabrum. Porcelain Menorah by Quest Gifts. Not just for Hanukkah, this gathering of graceful dancers would be great year round for every Shopping Girl’s celebratory or worship wishes. Notable is the ability to arrange this Menorah in many ways, since each dancer forms a separate figurine in the set. Clustered together, scattered about, or used individually here and there, these are downright wonderful all-purpose candleholders. Even better, you have a choice of goldtone or silvertone dancers. A set of both wouldn’t be a bad idea either. Joyous Dancing Menorah by Quest Gifts, in goldtone or silvertone. Here are the girls in silvertone, shown with candles. Dancing and candles; two great things that go great together! Speaking of great candles, tree-hugger Shopping Girls aren’t the only ones concerned about finding the best and safest options. Never fear, for Rite Lite has for you this box of Pure Natural Wax Chanukah Candles, made from premium organic vegetable waxes. Made with a blend of soy, palm, and bees’ wax, they are dye-free, biodegradable, hypo-allergenic, and petroleum free. While the white ones are lovely, you can also get a set with pretty assorted colored candles. A popular religious symbol, this golden palm frond menorah suggests tropical and desert climes, and will appeal to Shopping Girls who live or travel to such blessed lands. Pretty on its own as a sculptural decor object, it will glimmer and glow in the light of your Hanukkah candles. Designed by artist Michael Aram, it is also available in silvertone metal. If you like palm tree decor, you may be a coastal Shopping Girl, and will enjoy using these matches throughout your holiday. With seafoam-green match tips tucked inside, this gently colored matchbox features illustrations and the Latin names of pretty shellfish creatures. Seashell Decorative Boxed Matches. Shopping Girl lovers of wildlife will adore this Avant-Garde Ceramic Camel Menorah. The group of five camels is graceful and sweet, and will look pretty when lit by your candles tucked into the silvertone candle holders. If camels aren’t your thing, or if you wish to gift a menorah to a powerful family matriarch, you might fall in love with this Avant-Garde Ceramic Elephant Menorah. Seemingly several generations of family gather in the seven-elephant grouping, all overseen and guided by the Shopping Girl matriarch at the top. While holidays are known for their traditions, sometimes a Shopping Girl just needs to shake things up, start a new tradition, or follow a different path than the rest. Your path through the Festival of Lights might embrace this otherworldly looking menorah. The neon-green menorah doesn’t glow in the dark, unfortunately, at least in the normal sense, but it surely will radiate when lit with the included Hanukkah candles. This is a special commemorative piece commissioned by The Jewish Museum to celebrate its Centennial. Designed by artist Karim Rashid out of silicone, a totally cool Post-Modern substance, the metal candle holders can be removed for easy cleaning. Any wax drips will pop right off! This menorah is included in Design Edition JM, A Curated Selection Of Modern And Contemporary Jewish Ritual Objects By Extraordinary Designers Commissioned And Collected By The Jewish Museum. Another playful choice, this lineup of tasty donuts would make a charming menorah for display in your kitchen. The little chef is taste-testing a donut to make sure the quality is up to your Hanukkah celebration standards. Made of resin, this is perfect for children of all ages. Shopping Girls on a diet might want to avoid the visual trigger, however. But, why are you dieting during Hanukkah? Stop that. Have a donut. If donuts are too indulgent, then perhaps you would feel less guilt about owning this latke frying pan menorah? Because, as everyone knows, latkes are health food. Whimsical resin replica of a rather long stovetop and frying pan, each little latke on the grill holds a candle cup. Tucked under the frying pan’s handle are some more potatoes, ready to prepare for the next batch. At 12 inches long, that’s a lotta latkes. Did I just invent a new meme? Okay, okay…nobody can complain that pomegranates are unhealthy. They are loaded with antioxidants, vitamins, and likely other good things we haven’t discovered yet. This simple, jewel-like enameled menorah will gleam in candlelight; look dainty, yet rich; gentle, yet regal. A nice choice for a Shopping Girl with the same lovely qualities. At 14 inches long, this is a great choice that has visual impact but maintains a low vertical profile. Red Metal Pomegranates Menorah. Royalty decor is hot right now. This elaborately enameled and detailed brass menorah has a regal, heraldic look, featuring two lions rampant, along with a lot of other iconic symbols. In goldtone, with a filagree front gallery and orb-like candle holders, this stunning menorah will make you feel like a queen. Patina Brass Hanukkah Menorah With Bird by Shraga Landesman. With a clean-lined aesthetic, simple, abstract and yet natural, this lovely menorah can be used all year long as a lovely decorative object. Made of brass with varying patina colors, the momentary calm of a resting hummingbird is perfectly captured by artist Shraga Landesman. Look closely, and you’ll see that each colorful hummingbird is adorned with a different, fancy flower hat. Hummingbirds Square Boxed Matches. Break things up. Shopping Girls who are frugal, or have to deal with small quarters, like multi-use decor items. These Blue Topaz Hurricane Candle Holders come in several sizes and diameters, and are absolutely gorgeous. They’ll work great with MidCentury and Contemporary decor in particular, but you aren’t limited with these pillar candle holders, as the clean lines adapt to many themes. Sold individually, so you can buy a set to put together your menorah in the sizes you like. Hurricane candle holders are also great because they keep candles burning evenly in drafty places, contain drips, and keep the flames safely corralled from your guests’ sleeves and skirts. When not being used for candles, they make gorgeous flower vases and stash containers for guest soaps, desktop items, and other trinkets. Made in Poland, you can get these from Crate and Barrel. Shopping Girls are familiar with Crate and Barrel’s ability to stoke our shopping cravings. These napkin rings aren’t limited to the Hanukkah holiday by any means, but they certainly are perfect for your festival table setting. Hanukkah Candles Napkin Rings. Would you like your menorah designed as a tablescape of glittering beauty? Cluster these pillar candles onto a tray, or individual pillar platforms, for a contemporary display. The sparkling bright metallic silver filigree, featuring flowers, scroll-work, and Star of David motifs, stands out brilliantly against the deep blue background. Bed Bath and Beyond. Grab a cute cylinder of extra-long wooden matches in a seasonal color and theme. You get 60 in the box, which should be plenty! A striker pad is affixed to the bottom of the box. Build up worship energy with this compact dual-purpose option. One side has openings for your Hanukkah menorah candles; the other side, two candle cups for your sabbath candles. Compact, pretty, and sensible. Reversible Shabbat Candlestick Menorah. These remarkably beautiful taper candles will coordinate with the pillars shown above. I don’t know if I could bring myself to light them, they are so pretty. If you happen to have sterling candle holders, these will pretty much blow the roof off the joint. Set of two. Exclusively available at Pier 1, or so they say; they do appear to perfectly match the pillar candles sold at Bed Bath and Beyond. If you want both tapers and pillars, you might have to visit both stores. But Shopping Girls won’t have any issues with doing that. Like so many fine things, this is worth waiting for. Custom made to order by artist Chaim Gershi, it will take two or three weeks to complete. Made in Israel and embracing a Yemenite motif, the mind-blowing detail work results in the look of an antique, or perhaps more so, an antiquities score. Hand it down for generations to come. Another sterling silver menorah option, this one uses oil, rather than candles. Produced in a limited edition of only 150 numbered pieces by artist Luigi Del Monte, you’ll want to grab one quickly before they are sold out. When you are not using it for Hanukkah festivities, you can display it as a wonderful decor item in your home, either by itself, or with a curio featured on the interior platform, framed by the arch. The Arch Sterling Silver Hanukkah Oil Lamp. This shows the Sterling Silver Arch Oil Menorah folded open for lighting. Another oil lamp featuring sterling silver, this time with a marble base and glass insert cups. Made in Israel by artist David Ben-Zion, the elaborate sterling silver cups resemble crowns. The look is enhanced with sterling silver claw feet. Hand it down to the young ones; they will treasure it. This pretty metal matchbox holder features faux gems and pearls scattered among the branches and fruits of a pomegranate tree, all nicely framed in an arched window. It will stand up on its own, so you can perch it next to your menorah for a little extra sparkle in your holiday display. If you like the idea of using oil instead of candles in your menorah, you might like the convenience and color offered by this set. Instead of candles, these are tiny, sealed vials of olive oil, tinted in different colors. Each one already contains a wick. Included in the set is a tool to remove the top of each vial. Place the vial in your menorah, and light the wick; that’s it! Also available in a set of uncolored oil vials. Each vial will burn for up to three hours, making these a legit possible addition to one’s emergency kit too. This contemporary menorah set is kinetic; that is, you can arrange and rearrange it as you like, because each candle holder is separate. Sort by color…group…scatter…stack…the choice is yours. Obviously, though, the ones with burning candles in them should remain upright! The rest of the year, you can use this as a desk sculpture distraction. Designed by Adi Sidler, have fun with these satiny gleaming metal menorah elements. If that menorah wasn’t quite fun enough, how about adding these ballerina flamingo matches to your holiday gear? Beautiful bright hot pink wood matches are enclosed in a box with great graphics. The product name says they are doing The Can-Can but, as every Shopping Girl knows, one doesn’t Can-Can en pointe. However, as Moulin Rouge recommends: “If you can, Can-Can!” Pink Flamingo Can-Can Decorative Matchbox. Crystal Hanukkah Menorah with Square Candleholders. Something simple that isn’t plain. A lovely Art Deco-inspired design in beveled crystal that will sparkle with prism effects in candlelight. This kind of piece will work well with all kinds of decor schemes and table settings. It can stand on its own, or entwine it with flowers, garlands, vines, or other decorative items for a mantel, window, or tabletop display. Crystal Hanukkah Menorah with Square Candle Holders. Shopping Girl Millennials who are fans of Midcentury decor may not have yet discovered the endearingly odd charms of carved candles. A popular fad during the 20th Century, these ranged in shapes, sizes, and color schemes from mild to wild. Not commonly seen in a taper form, however, like these, with pretty, feminine roses and curves in Hanukkah’s classic blue and white color scheme. If you love a Romantic, Cottage, or Country decor look, these may be perfect for you. 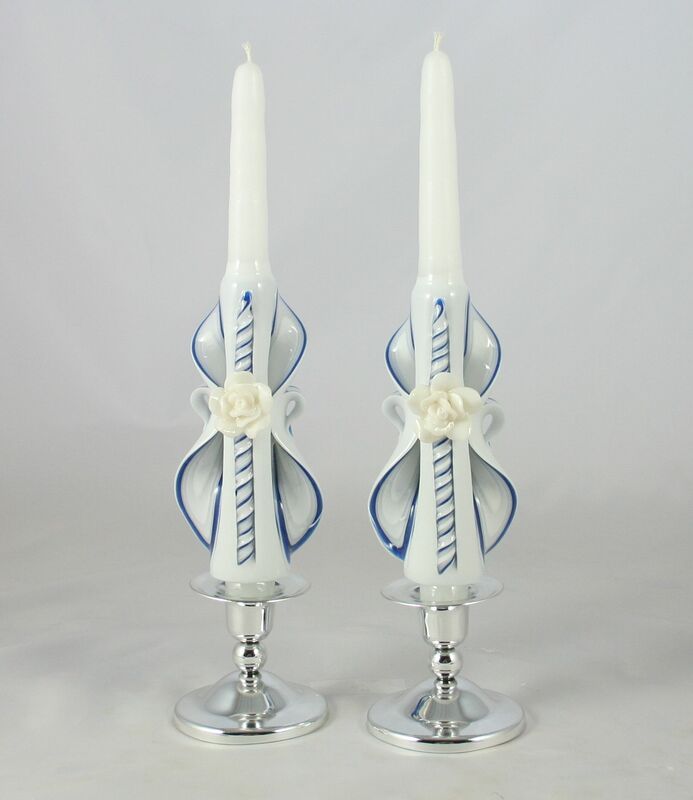 Royal White Cropped Candle Tapers with Rose Accent. Holland House Candles. This gentle, nature themed menorah comes with a smoked glass base. Reminiscent of an inkbrush floral painting, it is an excellent choice for placement in a low position, such as on a coffee table, where everyone can appreciate its artistic design from above. Handcrafted Wildflower Hanukkah Menorah, made by Quest Gifts. With vintage ephemera appeal, this box of matches contains oceany blue-tipped wood matches in a seafoam box with mermaids doing a sort of mermaid version of the Vanna White Maneuver on Wheel of Fortune. Mermaid Decorative Boxed Matches at Museum Outlets. There is something enchanting about small menorahs. This one, six inches high and made of aluminum enameled in cobalt blue, has wonderful lines. Easy to celebrate; easy to store until next year. Small Blue Enamel Finish Aluminum Hanukkah Menorah. This slick pocket menorah is meant for travel, but Shopping Girls living in cramped environs might like it too. Or use it at work. When closed, it is only four inches long, and 1-1/4 inches wide. The silvertone lid features three enamel stripes, and flips open to the side, revealing the candleholders and making a nice, stable base that is seven inches long. Your choice of stripes in warm or cool color tones. Hammered Metal Travel Menorah. Travel Box Menorah by artist Laura Cowan. A utilitarian, travel-friendly design that contains a special secret. Inside the unassuming little stainless steel box is a set of bright aluminum candle holders in a rainbow of retro colors. Even better, the tiny candle holders are magnetic! Cluster them inside the lid to contain any wax drips. Scatter on top of the box for a pedestal effect. A stash of candles is included for your Festival of Lights. Throw a box of matches in there, and you are good to go. Designed by Laura Cowan. Shopping Girls on the go, or at the office, may not be comfortable with (or permitted to) light real candles in their menorahs. No worries; get this set of LED Hanukkah Candles in Blue. Each candle runs on one AAA battery and, since they are LED lightbulbs, those batteries should last a long, long time. These faux candles are designed to fit into most menorahs. Bed Bath and Beyond. Real candles can make a mess. Wax not only drips, it can run, pool, stain, melt or dissolve what it touches. Cleaning rogue wax from surfaces is problematic, if not impossible in some cases. Avoid these candle hazards by adding Drip Cups to your menorah. Working like a typical candle bobeche, they nestle inside your menorah candle holders where you’d normally place the bottom of the candle. While designed to still fit the diameter of your candle, you now have an extra cup-like ring of protection that will capture overflowing wax. Up to a point, anyway. But Shopping Girls know that one should never leave burning candles unattended, for this as well as safety reasons. These useful little cups come in sets of nine, in your choice of silvertone or goldtone. Traditions Jewish Gifts. Rite Lite offers Chanukah For A Cause, a box of candles that supports Kosher Troops. This nonprofit organization works to assist U.S. military personnel who desire to adhere to a Kosher diet via various programs. So, you can help our American service members, and score some rather hipster, unusually colored, menorah candles at the same time. Get them at Traditions Jewish Gifts. If you have children, grandchildren, or immature relatives who like to play with toys (guilty), every one of them will look forward to seeing this cute train menorah coming around the bend every year. The train is made of soft brushed-look silvertone metal, with colorful candle holders on top of the cars and the engine. The web store doesn’t specify, but it looks to me like it definitely will roll. The cars are open inside too so, while you probably can’t squeeze any toy passengers in there, you could add sprigs of greenery or whatnot for an extra-festive presentation. The train is one foot long and will bring you festive cheer year after year. Hanukkah Menorah In Train Design. World of Judaica. What young Shopping Girl STEM genius wouldn’t love this space shuttle menorah? Named The Happy Hanukkah!, a tiny astronaut proudly stands, holding her flag, on the “alien planet” base. Okay, that’s probably an asphalt runway base, not an alien planet. But your kids can make it up however they want to, right? Enjoy this Space Shuttle Cast Resin Menorah, Live Long, and Prosper.